Bake the garlic bulbs by cutting them in half and drizzling the fat or oil on them, placing them cut side down on an oiled baking sheet (or wrap them in foil or use a covered ovenproof dish) Bake until completely soft and slightly brown – 30-50 minutes depending on the size of the garlic bulbs. This can be done in advance and if you bake more garlic than you need for this recipe, there are many ways to use baked garlic and the oil used to bake it. Using the oil from the garlic baking process, oil both sides of the French bread slices and set aside. Squeeze the garlic from the garlic skins and place it and the remaining oil in a heavy saucepan. Add flour. (You will need flour to oil in a 1:1 ratio and 1- 2 tablespoons of each per cup of liquid.) Add more fat or oil if necessary to create a nice creamy mixture of fat, garlic and flour. Let this simmer for just a moment, then whisk in the chicken broth. You should have a nicely thickened creamy soup. Adjust flavor with salt and pepper. Place the soup in ovenproof bowls and drop an oiled slice of bread on top of each bowl. Put under broiler until the bread is slightly toasted and serve! You can sprinkle Parmesan cheese on the bread before you toast it. 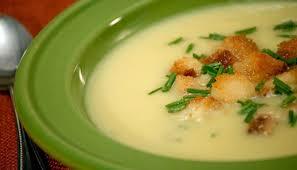 You can also add a splash of cream to the soup for extra richness.